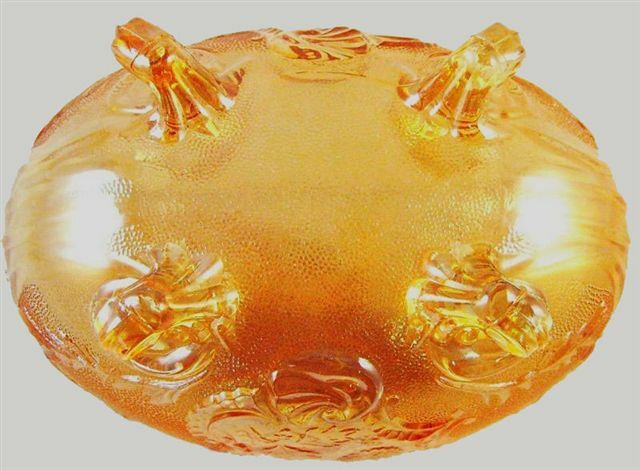 LOMBARDI Console Bowl - 10 in. long x 5.5 in. tall. 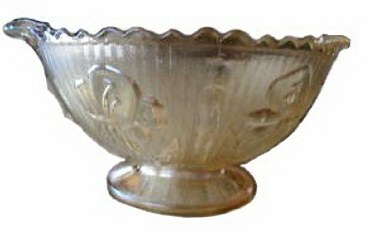 LOMBARDI Console Bowl - 6.5 in. wide. LOMBARDI: Both Jeanette and McKee produced this bowl during the 1960s and 1970s. It has been reported in milk glass, marigold, red/orange and blue/green (two-tonal quality), along with some having no iridization. IRIS & HERRINGBONE footed bowl with handles. 3 in. tall x 7 in. wide. IRIS & HERRINGBONE: was first manufactured in 1928-1932. It was produced again during the 1950s and into the 1970s. As with several other designs from this company, the market extended into modern times; well beyond the Depression era. FLORAGOLD Water Tumblers made 1950-1954. 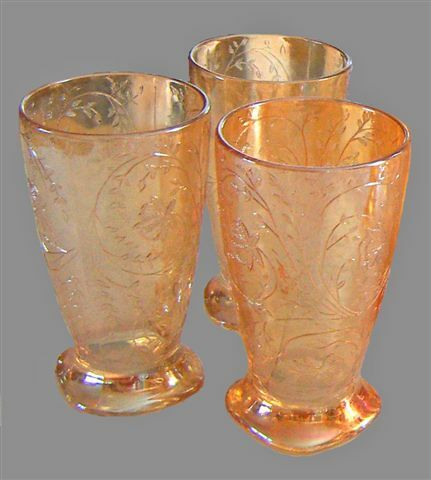 FLORAGOLD Tumblers: This is another of the modern-day designs from the 1950s. AZTEC ROSE in Original box. 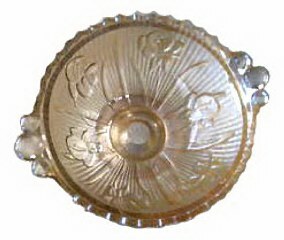 AZTEC ROSE Bowl: These originate from the ‘50s era of production. They are 2 ½” deep and were produced in 6 ½” and 8” diameter. 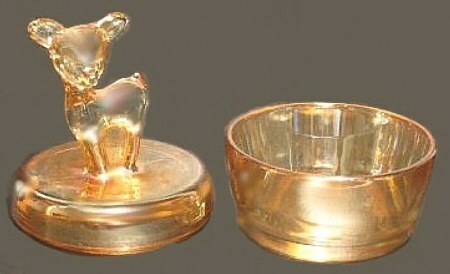 BAMBI Powder Jar - Six in. high x four in. wide. 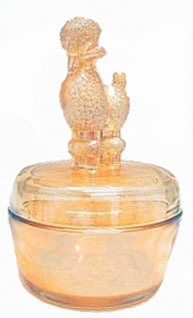 Left - POODLE Powder Jar - Six in. high x four in. wide. Right - SCOTTIE-Five and one fourth x four in. wide. 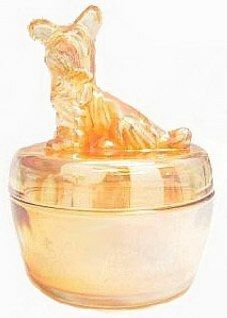 BAMBI - POODLE - SCOTTIE Powder Jars: were produced by Jeannette Glass from 1930-1950s. CUBIST Tray - 8.25 in. diameter. 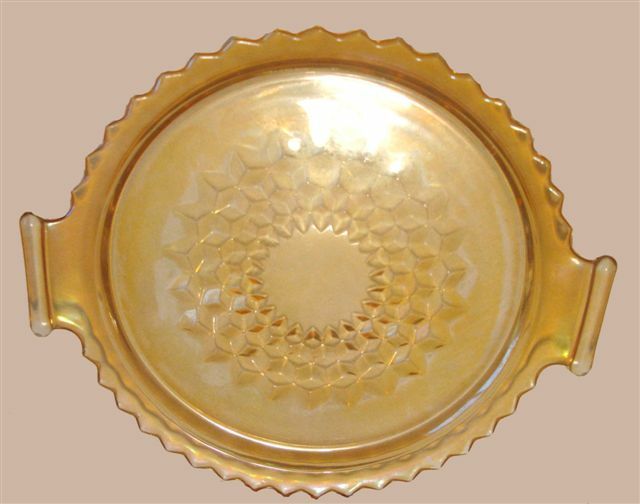 CUBIST TRAY: A pattern from the 1929 era. 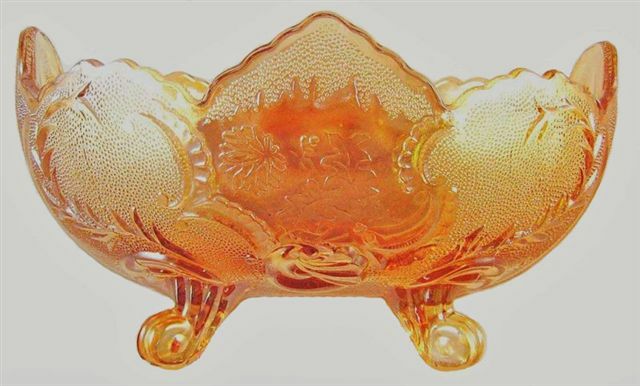 Many shapes are available on eBay in colors of clear glass, pink, green vaseline, amber, etc. STRIPED Jeannette Pitcher - 10 in. tall. 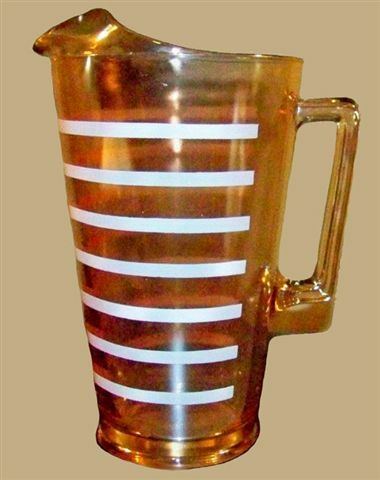 STRIPED PITCHER: Marketed well into the 1950s time period. You can read about the characteristics of a true believer in 1 John. It begins with the desire to be honest. This leads to the desire to confess our sins (1:9-2:2). We know that we can be forgiven because God is faithful, and Jesus is our advocate. “He who loves his brother abides in the light! (v-10). Jesus pointedly tells us in John 13:35, “By this all will know that you are My disciples, if you love one another. !